Rabbits can live happily inside or outside as long as their cage/hutch provides proper ventilation to avoid respiratory infection and protection from wind, direct hot sun, rain, extreme cold, and predators such as dogs, cats, snakes, foxes, eagles/hawks, and even mice. Besides the obvious danger these animals impose, they also carry disease and parasites. 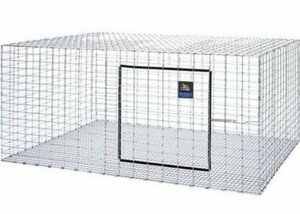 Hollands should have an indoor or outdoor cage that is ideally 30” x 24” x 18” (does/kits), but no smaller than 24” x 18” x 18” (bucks/juniors), with a raised 1/2” x 1/2” or 1/2” x 1” wire flooring with a dropping pan under the wire. We prefer dura trays as our dropping pans because we feel they’re easier to clean. We clean the cages and pans once a week with a bleach and water solution (1:10 ratio). We line trays with soft wood shavings that can be purchased from local feed stores for $5-6; this is much less expensive than buying shavings from well-known pet store chains. 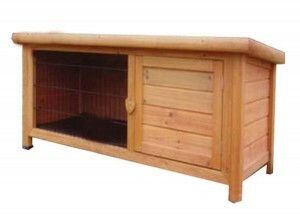 Hollands can also be kept in a wooden hutch outside. The hutch provides quite enough protection from wind and extreme cold temperatures, but rabbits can still be effected by extreme heat. Hutches are best to be placed in a secure area, preferably in a structured building or garage, but do well in shaded areas. 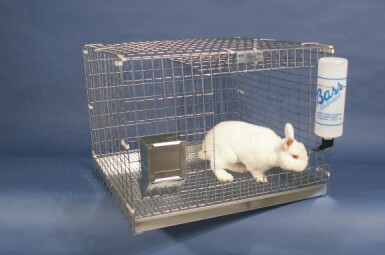 However, we prefer using wire cages with drop pans for our rabbits. You can purchase rabbit supplies from online vendors or at larger upcoming ARBA shows. Otherwise, for purchasing cages, wooden hutches, and supplies, please visit our links page to see some of our favorite online supply vendors.